Breast enhancement surgery has come a long way since women and their surgeons first started experimenting. According to research published in the Journal of Plastic Surgery by Walter Peters and Victor Fornasier, women have had anything from paraffin to silk fabric to glazier’s putty injected into their breasts. 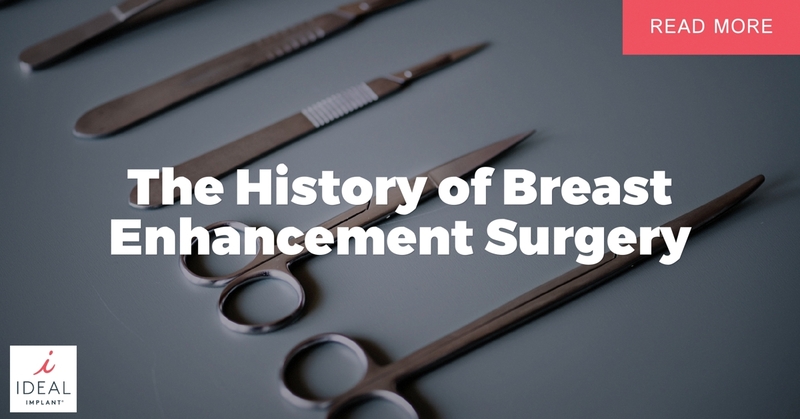 However, the sometimes terrifying history of breast enhancement surgery taught doctors and researchers some important lessons and thankfully women can now receive safe and effective breast enhancements from board-certified surgeons. Beginning in 1944 doctors started replacing the popular paraffin injections with liquid silicone injections. These silicone injections are not the same as the silicone-gel implants of today. Silicone gel implants used in today’s breast enhancement surgery are surrounded by a silicone shell to keep the gel in place. According to Peters and Fornasier, liquid silicone injections caused many of the same issues as paraffin injections: “migration of silicone to other parts of the body, inflammation, discoloration, and the formation of granulomas, ulceration and fistulae.” Despite its widespread use until the 1990s, liquid silicone has never been approved by the FDA to use as an injection for cosmetic purposes. The first silicone gel breast implants were developed in 1962 by plastic surgeons Frank Gerow and Thomas Cronin. After the initial breast enhancement surgery trials, the implants went through a number of revisions. While these implants were certainly safer than their predecessors, the FDA still did not issue an approval and the implants dealt with numerous safety issues. By 1992 the FDA issued a voluntary moratorium on silicone gel breast implants while they reviewed the safety of the devices on the market. A few months later the FDA approved several Pre-Market Approval applications from major silicone gel breast implant manufacturers. In 2006, after extensive study of the safety of silicone-gel breast implants, the FDA finally approved the implants for women 22-years-old and older. If you visit a board-certified plastic surgeon today to discuss breast enhancement surgery, you will likely see these implants as they are some of the most popular options on the market. Despite the safety of these implants when intact (not ruptured), the FDA recommends women whose implants have ruptured get the implants and any silicone that has leaked into surrounding tissue removed, whether or not the patient is experiencing complications. Saline implants, which consist of a silicone shell filled with sterilized salt water, have been available for breast enhancement surgery since 1964. After the FDA pulled silicone-gel implants from the market in 1992, saline implants became the only safe option for women seeking breast augmentation. The FDA has approved their use in women aged 18-years and older. Saline-filled breast implants continue to be used, particularly by women who feel uncomfortable with silicone gel implants and the risk of a “silent rupture” (when an implant rupture is not apparent to the naked eye and an MRI is required to detect it, a concern only with silicone gel implants). The major drawback to saline-filled implants is the lack of viscosity. Because saline is closer to the viscosity of water than breast tissue, these implants have been known to ripple, buckle, or otherwise look unnatural. This is especially true if the recipient does not have much breast tissue or fat in between the skin and the implant. However, in case of a rupture, the saline is harmlessly absorbed by the body. Is There a Better Option for Breast Enlargement Surgery? When silicone gel breast implants were finally approved women had two options: the natural feel of silicone gel or the peace of mind of saline. While both silicone gel and saline implants are safe and approved by the FDA, a recent survey has found that women still worry about a “silent rupture” of silicone gel implants and what that could mean for their future. In fact, in the survey, which included over 900 female respondents, 98% of those surveyed said they would feel somewhat concerned to constantly concerned about the possibility of a silent rupture. Finally, after years of listening to patient’s concerns, dealing with unnatural looking saline implants, and ruptured silicone gel implants, Dr. Robert Hamas decided to develop another option. The IDEAL IMPLANT: What is it? Dr. Hamas, a plastic surgeon and the inventor of the IDEAL IMPLANT® Structured Breast Implant, decided to find a solution for women who want the natural look of silicone gel and the peace of mind of saline. In 2006 he founded Ideal Implant Incorporated and began the process of developing an implant to address what women want and need for their breast enlargement surgery. The IDEAL IMPLANT is a saline-filled implant with a silicone shell and multiple internal layers of baffle shells to control the amount of saline that flows throughout the implant. Because the saline is controlled more than single shell saline implants, the IDEAL IMPLANT is stable and does not ripple easily, giving it a natural, beautiful appearance. After ten years of development, refinement, and clinical trials, the FDA approved the IDEAL IMPLANT® Structured Breast Implant for women 18-years-old and older. New Technology: Good or Bad? Now in 2018 women have three options for their breast enlargement surgery: saline breast implants, silicone gel breast implants, and the IDEAL IMPLANT® Structured Breast Implant. But, given the rough history of breast augmentation, how can you be sure these implants are safe? New technology wasn’t always a good thing in the past, which is evidenced by looking at the variety of materials doctors used to insert and inject into their patients. Fortunately, the medical community has become more regulated and has more accountability, which results in more safety for consumers. Today, with research, FDA clinical trials, and years worth of data, we don’t have to be in the dark about new technologies like the IDEAL IMPLANT. Breast implant research and trials today are transparent and nothing like the experiments of the past. With the extensive data and FDA trial requirements, women today can have confidence in newer technology. You can even review the summary of safety and effectiveness data for the IDEAL IMPLANT® Structured Breast Implant from the FDA. The focus of IDEAL IMPLANT has always been addressing the safety and concerns of breast enlargement surgery patients. The majority of IDEAL IMPLANT is owned by plastic surgeons who shared Dr. Hamas’s concern for women and desire to offer more options. Because of this, IDEAL IMPLANT only partners with board-certified plastic surgeons. To find a surgeon near you use the surgeon finder feature on the IDEAL IMPLANT website. Choosing breast implants is a big decision that will affect you for years to come. For more information about the IDEAL IMPLANT® Structured Breast Implant, visit the IDEAL IMPLANT website or make an appointment with a board-certified surgeon today.